A Great Lid - Price Matched! Really liked the look of this Lid and at the price here it was very attractive. However, on browsing, I noticed it quite a bit cheaper on the manufacturers website. Asked the guys here to price match it and they were happy to! Great deal and great helmet all delivered the next day! Bought this helmet for use on my 675 street triple but its just as much at home on my r1. The ventilation of this helmet is amazing. I cant wait to use it in summer. This helmet is loud but once I fitted the intercom to it and placed the speaker correctly its just as quiet as my Shoei GT AIR. Very happy with the purchase, it's light with less wind buffering than I thought it would have, even on the motorway. Super impressed with this helmet. A great light weight design with amazing all round visibility. Very comfortable and with a dark visor it sure looks the great. I bought this as my everyday helmet. It is exceptionally light and comfortable. I just wish it had more airflow and then it would be close to perfect (I live in Portugal, it does get warm down here). Firstly, the helmet looks great. The fit is tight initially but is very comfortable. 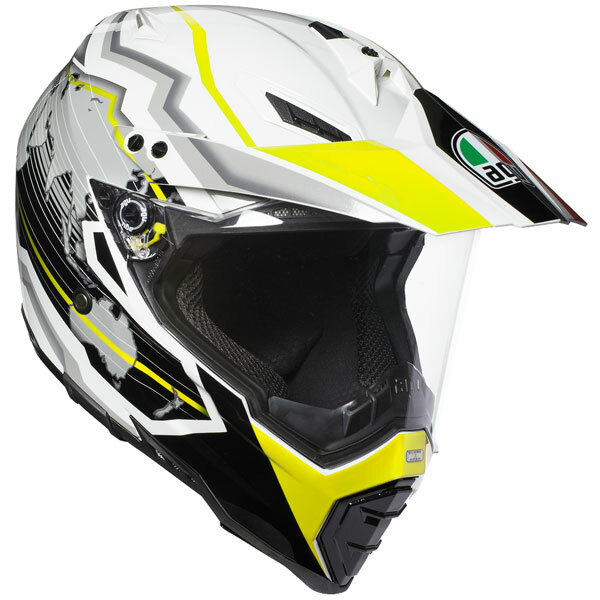 Visibility is superb and the visor can be lifted easily on the move. There is no Pinlock, but fogging hasn't been an issue. The reduced price is an added bonus. This helmet is super light and comfortable. I was going to get an Arai this time but I've always had an AGV helmet in the past and because the colours match my bike thought why not another AGV. Only downside is I am struggling to get my Scala to fit but this could just be me. Love the look, the feel, the overall everything about this product. Would definitely buy AGV again. Pros, Great airflow so nice and cool: Very comfy: Very light: Visor doesn't catch wind too much great visibility. Cons, Quite loud: Visor fogs up too easily. Very comfortable, incredibly light. Large viewing window. Helmet does not fatigue rider on long rides. Only drawback to the helmet is the peak can vibrate if motorcycle screen pushes wind into it. 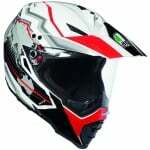 Great helmet for the money, very comfortable. My only criticism you can hear a lot of wind noise ! Bought this before a trip to Europe. Got 30 miles down the road and the peak flew off. One side did anyway. Stopped straight away checked the other screws which had been lock tightened. Swapped a couple of screws around and after that it was a good helmet for the 2k I rode. Could do with some extra screws. Probably the best helmet I've ever had. Super light weight and a HUGE viewing area. Airflow is good and the quality is superb for its price. I bought this helmet back in November 2016, but didn't get to use it until the weather cleared up. First off, it's styling is bang on trend. I removed the peak for use on my GSX-R, and my Kawasaki triple, but will put it back on for off roading on my DT125R. Secondly you will not believe how light it is. Fit is a bit snug around the ears, and you need to move your chin out of the way of the gauzy draught excluder under the front edge (it will pop out) when removing the helmet, but it's comfy, has good around visibility, and shifts a lot of air when the vents are open. Will have to see how the lining holds out long term, but it seems well made. The helmet comes with an alternative ratchet for the face shield. The one that's fitted gives several intermediate closing points, the alternative overs a continuous uninterrupted closure. Don't know why you would want to sacrifice the ability to have it partially open and not slam shut on the move, but if that floats your boat AGV have got you covered! Price when I bought it was competitive at just over £265. Effectively two lids in one, might possibly try it with goggles but not sure. Light, adaptable, stylish and not stupidly expensive. Only thing it's crying out for is a flip down internal sun visor, but that adds weight and possibly structural issues in the temple area. Very pleased with it. Great service, great price and a great product. Very comfortable and light, easy to use the vents and the clasp. Great service and quick delivery. Nice helmet, fits perfectly. Only issue is the vibration over 120kmh, may need to remove the peak for long trips but love it so far.